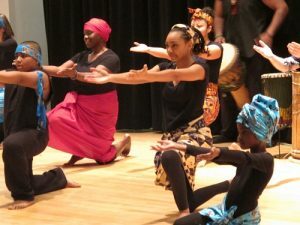 Anthony Wooden, Director of Bokandeye African Dance and Drum Troupe returns to the library for another series of free African dance workshops for children ages 7 and up, as well as their parents. This popular series, now a tradition at the library, provides instruction of native African dance, while also instilling an understanding of the rich cultural meanings of the movements, rhythms, dress, African village life, and the role of the extended family. Registration will take place at the first class. Culminating Performance: Saturday February 24th at 2:00 p.m. Ossie Davis Theater. Free.